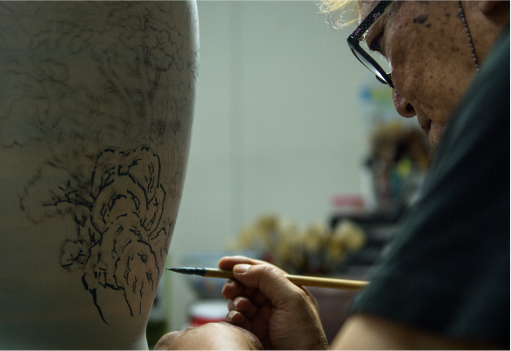 Seventh generation family-owned ceramics workshop, Arita Porcelain Lab, has carried on the Arita-yaki kiln craftsmanship legacy for over four centuries. The Arita-yaki kiln dates back to the early 17th century when the head of the Nabeshima clan, Naoshige Nabeshima, unearthed the mineral matters that have since been used to make Arita porcelain. Located in the Saga Prefecture on Kyushu Island, Arita quickly became the epicenter for porcelain production and knowledge in Japan. The Arita-yaki kiln and the porcelain industry thrived until the 20th century when the political and economical situation in Japan caused for the craft to experience a decline. The Arita Porcelain Lab is one among a small group of local craftsmen that has continued to make porcelain of the highest quality, using materials and processes unique to the territory. Magnetic ore was first discovered in Japan by Lee San-Pei in 1616. This triggered the beginning of Arita Ware. Mining lasted for the 380 years between the Edo era and the mid-Meiji era, and is said to have “converted an entire mountain into porcelain within 400 years”. The 400-year long history of Arita Ware is due to its development into products of distinct characteristics at various sites, mainly into the three most famous styles: Koimari, Kakiemon and Ironabeshima. Further interactions with foreign countries led to the creation of the Kinrande-style. The continuous adaption to different regions and times has led to the present-day Arita Ware.